Once the nation's leader ​in mining and metals manufacturing, Pittsburgh has reemerged over the past decade as a thriving center of health and medical research, education, and computer software development. Much of the city's renaissance has centered around the conversion of former industrial concerns into cultural attractions. The residential and commercial building stock, which dates from the late 1800s, has been remarkably well preserved, and fans of architecture and preservation have learned to take advantage of Pittsburgh's 88 neighborhoods. Gays and lesbians are a marked presence in North Side, South Side, Shadyside, Oakland, Polish Hill, and increasingly farther northeast in Lawrenceville and East Liberty. The gay scene is fairly dispersed; there's no exact gay hub in Pittsburgh. This means the community is well integrated with the mainstream population. Major Pittsburgh corporations like ALCOA, PNC Financial Services, BNY Mellon, and Heinz are key sponsors of the annual Gay Pride celebration each June, which is one of the most activity-packed and well-attended of any mid-size US city. Particularly among the under-30 set, gays and straights mix at many bars, restaurants, and coffeehouses. The city has numerous theaters with artsy and gay-themed films and a high appreciation of alternative culture. Consider the fact that two of its top attractions are the provocative Mattress Factory contemporary art museum and the fascinating Andy Warhol Museum. Hilly Pittsburgh is the largest city in western Pennsylvania and is situated at the confluence of the Ohio, Allegheny, and Monongahela rivers. It's one of the urban hubs of Appalachia, a historic city with deep ethnic roots that pervade in most of its nearly 90 close-knit neighborhoods. The steep, sometimes narrow streets of outlying neighborhoods remind some of San Francisco, while the city's many narrow rivers and color bridges—plus the artsy vibe and progressive sensibility—inspire comparisons with Portland, Oregon. Pittsburgh is reached via I-76 (the Pennsylvania Turnpike) to I-376, and north-south I-79, which leads to I-70. The city is just 30 miles from the West Virginia border and 40 miles to the Ohio border. Pittsburgh International Airport is an easy 18-mile drive west of downtown and is served by most major airlines, with direct flights throughout the Midwest and Eastern Seaboard (as well as international destinations including Cancun, Paris, Punta Cana, and Toronto), plus a handful of direct flights to major West Coast cities. The city's Pittsburgh Convention & Visitors Association has a wealth of trip-planning information. Check in with the Pittsburgh Gay and Lesbian Community Center for local community resources and referrals—the center is 210 Grant St. The city's Out Newspaper is an excellent source of information on the local gay scene, and the alternative newsweekly, Pittsburgh City Paper, has excellent coverage of dining, nightlife, the arts, and progressive issues. Additionally, the city's paper, the Pittsburgh Post-Gazette, is a partner of Pittsburgh Gay Pride and a well-respected news daily. You'll also find further information on the city's gay scene at the Pittsburgh About.com Gay Resource Page. Although Downtown (aka "The Golden Triangle") contains only a hint of what greater Pittsburgh has to offer, its handsome contemporary skyline and regal command over the confluence of the Ohio, Allegheny, and Monongahela rivers imbue it with a stately countenance. Begin exploring at landscaped Point State Park, where Forts Duquesne (pronounced doo-kane) and Pitt once guarded the settlement. Today, the Fort Pitt Museum houses exhibits on the city's early history. The Golden Triangle comprises Pittsburgh's thriving business district, but aside from the eclectic architecture and the live bands entertaining lunchtime brown baggers at Market Square (at Forbes Avenue and Market Street), there are few major attractions here. The square, however, lies in the shadows of Pittsburgh's most remarked-upon building: PPG Place (at Stanwix Street and 4th Avenue), a neo-Gothic monolith designed by openly gay architectural icon Philip Johnson. Liberty Avenue runs northeast from near here and has several of the city's most popular gay bars; with parallel Penn Avenue they're the spines of a 14-block Cultural District (aka "The Penn/Liberty District") of theaters and performance halls housing the Pittsburgh Symphony Orchestra, the Pittsburgh Ballet, the Pittsburgh Opera, and other well-regarded theater companies. Penn Avenue leads northeast to a historic warehouse district, The Strip, that's now a clutch of nightclubs, hip restaurants, art galleries, and offbeat shops; many businesses here have an artsy and fairly gay following. Adjacent is Down by the Riverside Boardwalk, a massive complex with a marina, restaurants, and a floating boardwalk, and the John Heinz Pittsburgh Regional History Center, a fantastic museum that chronicles the city's history with imaginative exhibits and memorabilia. 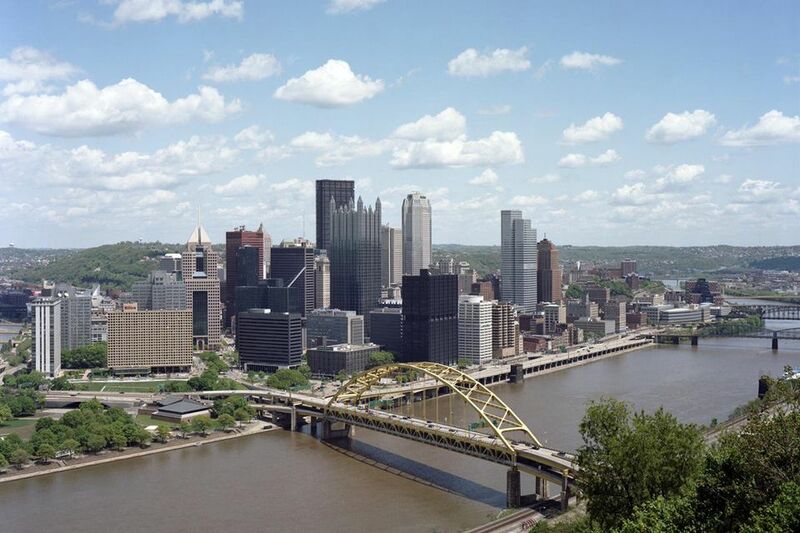 The North Side lies just across the Allegheny River from downtown and is home to PNC Park, home of baseball's Pirates; Heinz Field, home of football's Steelers; and a slew of intriguing arts and cultural attractions. The Andy Warhol Museum celebrates the life of the late Pop Art icon, who grew up in nearby Oakland. Created inside an eight-story, 1911 steel supply warehouse, the museum contains 8,000 works and is an outstanding, engaging, and often very funny museum, laid out with abundant commentary on Warhol's life (and his homosexuality). Within walking distance are the kid-friendly Carnegie Science Center; the National Aviary, with its numerous bird-life habitats that allow up-close looks at species from around the world; and the Mattress Factory Art Museum, known for its provocative larger-than-life installations created by visiting artists in residence. The Mattress Factory is also home to a great little eatery and coffeehouse, the Box Spring Cafe. It's located in the historic Mexican War Streets neighborhood, a 27-acre area whose narrow streets are lined with beautifully restored townhouses, mostly from the 1840s and 1850s. You'll detect a handful of rainbow flags in this diverse district. South of downtown, across the Monongahela, the city rises sharply above the river toward Mt. Washington, a workaday neighborhood whose commercial drag, Grandview Avenue, hugs the ridgeline and offers spectacular views downtown. Ride up the slope via the Monongahela Incline, by Station Square, which leads to a viewing platform and a small museum. You can combine your ride on the incline with a visit to Station Square, a redbrick complex, formerly a freight yard, that houses quirky stores, a Sheraton Hotel, and some touristy nightclubs and restaurants. A short drive east is the bohemian South Side, a repository of funky shops, galleries, and eateries. Once the heart of the city's Lithuanian and Polish communities, Carson Street is now lined with music stores, bric-a-brac emporia, coffeehouses, and edgy galleries. Follow Penn Avenue northeast from the Strip District, turning left and continuing onto Butler Street, and for nearly 2 miles along Butler, you'll pass through the heart of one of the most interesting, creative, and eclectic neighborhoods in the city, Lawrenceville. This largely working-class district whose blocks were laid out in the early 19th century by the father of composer Stephen Foster have in recent years attracted artists, students, designers, gays and lesbians, young families, and hipsters. You'll find some of the hottest restaurants and distinct shops and galleries in these parts, plus a couple of gay bars. A few miles east of downtown, Oakland was built from the gobs of money generated during Pittsburgh's industrial heyday and today contains offices, hospitals, universities, businesses, and the heart of the city's computer software industry. Forbes and 5th avenues anchor the University of Pittsburgh and formidably endowed Carnegie Mellon University. Collegiate shops and cafes surround these two campuses, both of which have their share of attractions. At CMU, visit the four Carnegie Museums of Art and Natural History, which contain well-conceived architectural and decorative arts exhibits, a cache of artifacts from ancient Egypt, and the nation's third-largest dinosaur collection. Across the street, towering 42-stories above Pitt's campus, is the second-tallest school building in the Western world, the Gothic-style Cathedral of Learning. Head to the 36th-floor observation deck for views of the region. Nearby Schenley Park, ideal for a stroll, is anchored by the 1893 Phipps Conservatory, comprising 13 rooms of exotic flora. East of Oakland is Shadyside, a gentrified patch of neatly kept yards and attractive old homes. Although more gays live here than elsewhere in Pittsburgh, it's a mixed neighborhood and by no means strictly or even predominantly a gay neighborhood. Ellsworth Avenue (around the 5800 block) has several gay-popular eateries and businesses, and more chichi Walnut Street (along with the 5500 block) holds mid- to high-end chain stores. As you venture a bit east on Ellsworth Avenue to Penn Avenue, a left turn leads into another up-and-coming neighborhood of hip restaurants, mixed gay-straight lounges, and indie shopping, East Liberty. Just south of Shadyside, Squirrel Hill is a charming neighborhood known for its ethnic restaurants and small-town vibe; quite a few students and faculty from nearby Carnegie Mellon and Pitt live here. It's a short drive east to Clayton, the Frick Art and Historical Center, the former estate of industrialist Henry Clay Frick that now consists of a magnificent mansion and other historic outbuildings. The center contains an outstanding collection of European master paintings. Frank Lloyd Wright's most celebrated residential creation, Fallingwater, is worth the 90-minute drive. To reach the house, which is cantilevered precipitously above a rushing waterfall, head southeast about 60 miles on the Pennsylvania Turnpike to Donegal; from here, drive 15 miles south on Route 381. You can also buy a combination ticket good for admission and a tour of Kentuck Knob, one of Wright's later residential creations, which is just a 15-mile (windy, though scenic) drive from Fallingwater. It's an interesting house, more intimate than Fallingwater, and well worth touring as well. Pittsburgh is a straightforward restaurant city, whose strengths include the German and Eastern European cuisines of its many 19th-century immigrants. A good number of gay-friendly restaurants exist in Pittsburgh. A few eating establishments to try for gay-friendly dining include Point Brugge Cafe, a quaint little bistro known for its Belgian-inspired comfort food as well as its craft and Belgian beers; Enrico Biscotti, in the historic Strip District, rated one of America's top bakeries and known for its brick-oven pizza and homemade wine; the Sewickley Cafe, a wooden-grained establishment located downtown with a menu featuring traditional American continental cuisine; and Winghart's, an outstanding and highly rated burger joint doubling as a whiskey and cocktail bar. When it comes to gay nightlife, Pittsburgh specializes in neighborhood bars where the staff and patrons know each other and newcomers rarely enter unnoticed. Even with the city's transformation into a trendy, high-tech metropolis, the gay scene remains fairly low-key and not a major clubbing destination, despite how Pittsburgh was sometimes portrayed in TV's Queer as Folk. This isn't to say the city lacks an edge. Pittsburgh has a strong leather presence with a progressive music and social club scene in the Strip, Shadyside, Lawrenceville, and other neighborhoods. A few gay-friendly bars in Pittsburgh include P Town, whose customers are mainly college students, young professionals, and retirees. P Town describes its clientele as a mix of "straight, gay, bi, trans, bears, twinks, leather dudes, drag queens, and every other cross-cultural personality out there." The Blue Moon tops the list of Pittsburgh's best gay bars and delivers on drinks and entertainment. Gay-owned and operated, the Blue Moon offers video entertainment, a pool table, and a private patio. The crowd is diverse and friendly, and Blue Moon’s drag performers are top-rated. For some of the wildest nights you ever want to experience, visit the Cruze Bar. College nights, happy hour specials, and entertainment such as underwear parties and drag shows keep the city’s gay community coming back for more. Located on Smallman Street in the city’s Strip District neighborhood, even Sunday is sinful as the Cruze Bar offers 20% off cocktails, wine, and beer. CAVO Restaurant Lounge Nightclub is perhaps one of the Pittsburgh gay scene's best dance clubs. Located in the city’s Strip District area, CAVO packs the dance floor that moves to the beat of the in-house DJ's picks. CAVO offers a modern, stylish atmosphere, great bottle service, and friendly bartenders. You'll find a good selection of mid- to high-end chain properties in downtown Pittsburgh, an easy walk from the gay bars on Liberty Avenue as well as many prominent attractions, and a 15-minute walk to the museums and sports parks of the North Side. The city also has a handful of B&Bs popular with GLBT visitors, located mostly in distinctive neighborhoods close to shopping, dining, and nightlife. The Portland, Oregon-based Ace Hotels, whose properties are known for the hip design and a hipster following, entered the Pittsburgh market late in 2015 with a 63-room Ace Hotel Pittsburgh set inside a converted YMCA building in trendy East Liberty. Also in East Liberty, the boutique-ish Indigo Hotels brand has opened the mod Hotel Indigo Pittsburgh East Liberty. It's quickly developing a following among savvy, design-minded LGBT travelers, and the rates are quite reasonable considering the comfy and stylish rooms. Staying at one of the city's gay-friendly B&Bs affords visitors a chance to better appreciate some of Pittsburgh's most charming neighborhoods. On the North Side, for instance, you'll find a handful of excellent small lodgings within walking distance of the Warhol Museum, Mattress Factory, and National Aviary. A few blocks west of the Aviary, the gay-owned Parador Inn of Pittsburgh is operated by helpful innkeeper Ed Menzer; this stately, redbrick mansion contains nine cheerfully furnished rooms with vibrant colors and furnishings that recall Key West and Caribbean locales. These are some of the largest and most beautifully furnished rooms and suites in town, and rates include a full breakfast. Be sure to take time to explore the lush gardens. Nearby, the Inn on the Mexican War Streets occupies the marvelously restored mansion of one of the city's department store barons, R.H. Boggs. The eight rooms and suites are elegantly furnished, with some overlooking West Park (site of the National Aviary). In a residential area a mile or two north of the North Side museums, the gay-owned Arbors B&B is a charming and relatively peaceful place to stay. This 19th-century converted farmhouse overlooks gardens and mature shade trees. There are three reasonably priced guest rooms, each with a tasteful, unfussy look; one suite has its own separate sitting room. Amenities include a sunroom with a hot tub and radiant-heat floors, and a continental breakfast is included. In the heart of trendy Shadyside, near gay-popular bars and eateries on Ellsworth Avenue, the Inn on Negley is a handsome Victorian house with some of the most romantic and gorgeously furnished rooms of any property in town. It's a favorite choice for a special-occasion getaway, and its eight rooms and suites are equipped with L'Occitane bath products, BOSE radios, robes and slippers, and top-quality linens. Breakfasts here are a real treat and are prepared by a professional chef.